Return gift potali bags made on soft satin fabric with elegant floral prints on it. Elegant potali bags has some foils rings printed too with floral print to give designer look. Satin potali bags has knot type handle with round pipin base. Potali bags with rings available in cream base with different flower colors. category:round potli bags, product :12 INCH BOX SAREE COVERcategory:round potli bags, product :2 INCH SINGLE POLKA DOT SAREE COVERcategory:round potli bags, product :BOARD BASE POTLI BAGS. TISSUE GIFT BAGScategory:round potli bags, product :HAND WORK BUTA SLING BAG. VELVET SLING BAGcategory:round potli bags, product :POLKA DOT GOLDEN GHAGRA COVERcategory:round potli bags, product : POLKA DOT SINGLE SAREE COVERcategory:round potli bags, product :SMALL VELVET POTLI. CHOCOLATE POTLIcategory:round potli bags, product :ROUND COSMETIC POUCHES. PLASTIC POUCHEScategory:round potli bags, product : VELVET LACE POTLI. CHOCOLATE POTLIcategory:round potli bags, product :VELVET LACE POTLI. GIFT POTLIcategory:round potli bags, product :COTTON FOIL PRINT SHOPPING BAG. PATOLA SILK HAND BAGScategory:round potli bags, product :EMBROIDERED HAND PURSE. DESIGNER EVENING BAGcategory:round potli bags, product :FLORAL PRINT GIFT BAGScategory:round potli bags, product :MAROON LACE SINGLE SAREE COVERcategory:round potli bags, product :MAROON COSMETIC HANGING ORGANIZERcategory:round potli bags, product :2 INCH GOLDEN BOW SAREE COVERcategory:round potli bags, product :BROCADE SILK BAG. FABRIC SHOULDER BAGcategory:round potli bags, product :GOLDEN SINGLE SAREE COVER. SATIN SAREE COVERcategory:round potli bags, product :GOLDEN PIPIN BOX SAREE COVERcategory:round potli bags, product :MAROON BORDER 2 INCH SINGLE SAREE COVERcategory:round potli bags, product :12 INCH POLKA DOT SAREE COVER SETcategory:round potli bags, product :DESIGNER POTLI BAG. 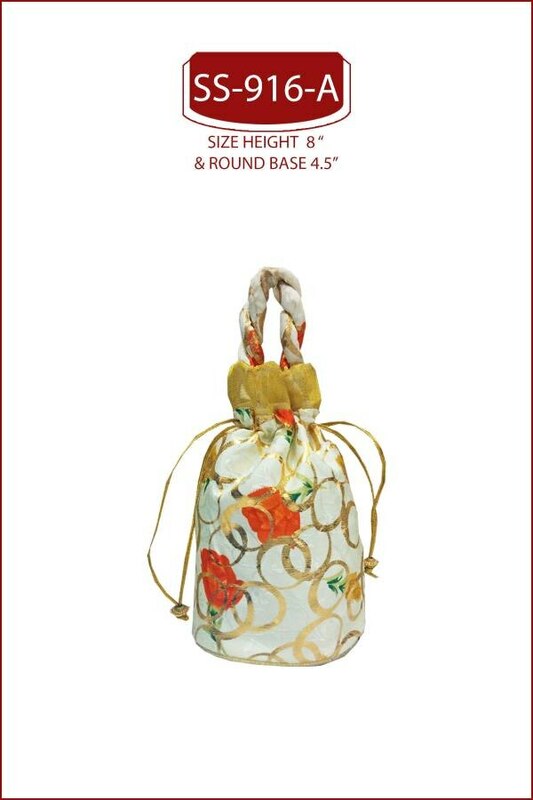 TISSUE POTLI BAGcategory:round potli bags, product :IMPORTED VANITY POUCH. COSMETIC VANITY POUCHcategory:round potli bags, product :LACE SILK ENVELOPES. BORDER ENVELOPEScategory:round potli bags, product :NETT TROUSER COVER. TRANSPARENT TROUSER COVERcategory:round potli bags, product : SILK BROCADE BAG. DESIGNER SILK BAGcategory:round potli bags, product :POLKA DOT BOX SAREE COVERcategory:round potli bags, product :JUTE PRINTED CLUCHES. ECONOMICAL RANGE CLUTCHEScategory:round potli bags, product :LACE EMBROIDERED HAND BAG. EMBROIDERED HAND BAGcategory:round potli bags, product :NON WOVEN BOX SAREE COVERcategory:round potli bags, product :THREE PIECE SET IMPORTED COSMETIC ORGANIZERcategory:round potli bags, product :FOIL PRINT BOX SAREE COVERcategory:round potli bags, product :DESIGNER HAND POUCHES. NETT POUCHEScategory:round potli bags, product :NETT SHIRT COVER. TRANSPARENT SHIRT COVERcategory:round potli bags, product :FOIL PRINTED BROCADE BAG . 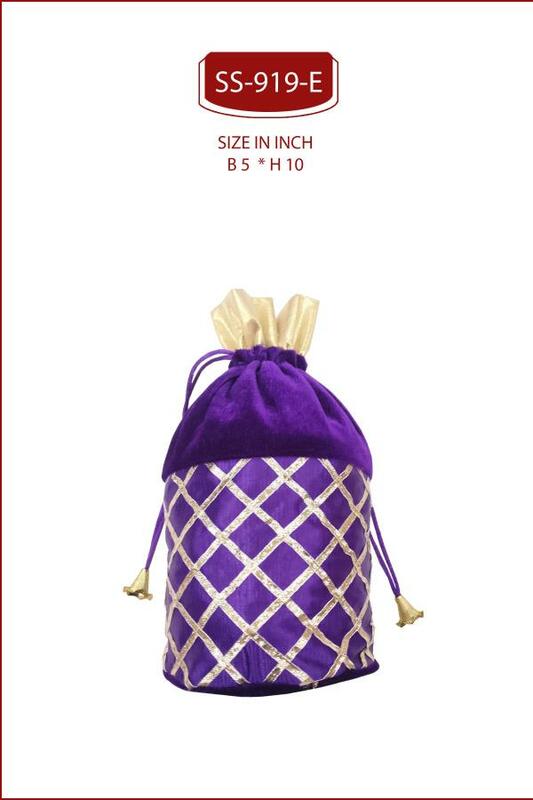 BROCADE LADIES HAND BAGcategory:round potli bags, product :DESIGNER ETHNIC HAND BAGScategory:round potli bags, product :NON WOVEN PARTITION UNDER GARMENT ORGANIZER. 4 PIECES SETcategory:round potli bags, product :DESIGNER EMBROIDERED POTLIcategory:round potli bags, product :BROCADE JEWELLERY KITcategory:round potli bags, product :NON WOVEN BOX SAREE COVERcategory:round potli bags, product :BROCADE HAND BAG.SILK HAND BAGcategory:round potli bags, product :DRAWER UNDERGARMENT ORGANIZER SETcategory:round potli bags, product :PATOLA FABRIC SLING BAG. DESIGNER SLING CLUTCH BAGScategory:round potli bags, product :PATOLA SILK CLUCH BAG. ECONOMICAL RANGE CLUTCH BAGcategory:round potli bags, product :EMBROIDERED CLUTCH BAGScategory:round potli bags, product :HAND WORK BUTA SLING BAG. VELVET SLING BAGcategory:round potli bags, product :HEART SHAPE COSMETIC POUCH. PRINTED COSMETIC POUCHcategory:round potli bags, product : EMBROIDERED SILK BAG. EMBROIDERED TISSUE BAGcategory:round potli bags, product :PRINTED TOTE BAGS. DESIGNER TOTE BAGScategory:round potli bags, product :DESIGNER CLUTCH BAGS. EXCLUSIVE SILK CLUTCHEScategory:round potli bags, product :COSMETIC POTLI. IMPORTED COSMETIC ORGANIZERcategory:round potli bags, product :HAND WORK DESIGNER BAGcategory:round potli bags, product :IMPORTED PLASTIC SHIRT COVER. GOLDEN SHIRT COVERcategory:round potli bags, product :GOLDEN LACE BAG. DESIGNER LACE BAGcategory:round potli bags, product :SILK EMBROIDERED BAGS.